You want a shortcut to happiness because you don't want to wait forever for it. You want to be happy now, and all of the time. You (like most people) want to be happy because that's when you're at your best. First order of business...happiness comes from inside you, not from outside. The powerful tools you will learn here will only work if you understand that you're in charge of your thoughts, actions and emotions, and if you're willing to do some simple exercises on a regular basis. Now let's dive right into each of these steps, you can get started on your shortcut to happiness! If you're not completely sure of what I mean by "setting your intention," don't worry, you will be. That's what this page is all about. It's just a matter of using your brilliant mind to pave the way to the happiness you want. You can practice these during meditation, as a form of prayer, or while performing some other daily activities...that's why they work all day every day! 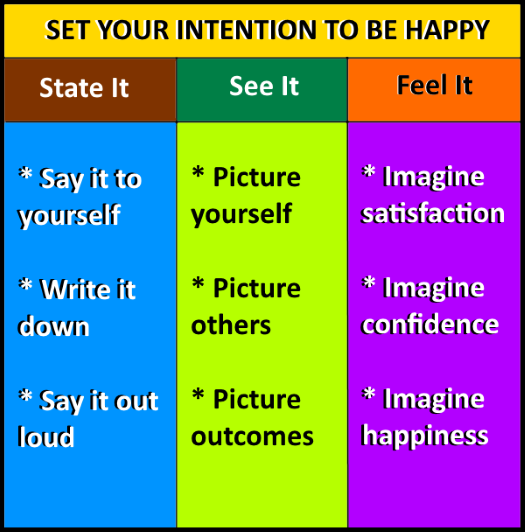 State your intention -- Put the words together in your head, and think about them in your mind. For example, "I'm going to have a wonderful time at this event, and feel great before, during and after." Then write it down (in your journal, if you have one), and finish by saying it out loud to someone who will be totally supportive to you. If that person is not available, just say it out loud to yourself. See it happening -- Picture what you want in your mind's eye. Visualize yourself calm and confident, having a great time, and picture others responding to you in a positive way. Finish this step by picturing the outcomes you want, in as much detail as you can think of. Feel it -- Imagine yourself feeling the deep satisfaction and confidence you want to feel in the situation you're focusing on. Whether it's the day ahead of you, an important meeting, or a family gathering, imagine yourself feeling exactly like you want to feel, before, during and after the event. Then...imagine how happy you'll be! These are tools. They are only useful if you use them. Set your intention to use them every day for two weeks, and you will see results. Let's take a look at some practical examples, to make this easier for you. Here are some ways you can put these tools to work for you. I'll give you three examples to work with, and that will get you started. Be sure to use this enough to make it your own...meaning, apply it in a way that works really well for you. Set your intentions for your day -- As you start your day, enjoy your favorite morning beverage, relax, and set a powerful intention for the kind of day you want to have. Remember to state it, see it and feel it. All three steps are equally important. Why not make every day a great day! Set your intentions to change your behavior -- For example, set your intention to feel good before, during and after each meal, and you'll be more likely to eat healthy food and healthy portions. Also set your intention to get some exercise, smile, and be friendly to the people you meet. People will be more likely to help you! Set your intentions to achieve specific outcomes -- To create business success, make more money, or to meet new people, be sure to clearly and powerfully state, see and feel what you want. State (think, write and say out loud) what you want, see it happening in your mind's eye, and try your best to feel the good feelings that will come when you succeed. One of the best ways to do this is during a meditation period. Learning meditation is one of the greatest gifts you can give to yourself. The benefits of meditation are so great that it's hard to wrap your mind around them. This will help you with every single aspect of your life. 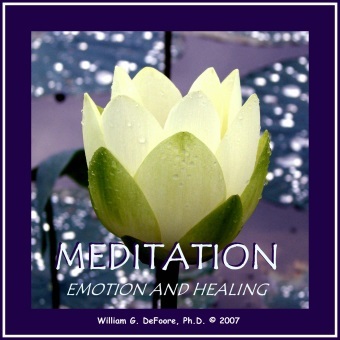 Here is a chance for you to learn meditation and begin making it a part of your daily life. So, relax and get started on your journey to well being. You can do this! You have the will and determination to use these tools, and make them work for you. Don't let anything stop you from reaching your goals! Learn more shortcuts to happiness, and come back to see us soon!